PDA Band is a high energy 8 piece party band, not only praised for their talent and incredibly extensive songbook, but also for their advanced choreography and showmanship. 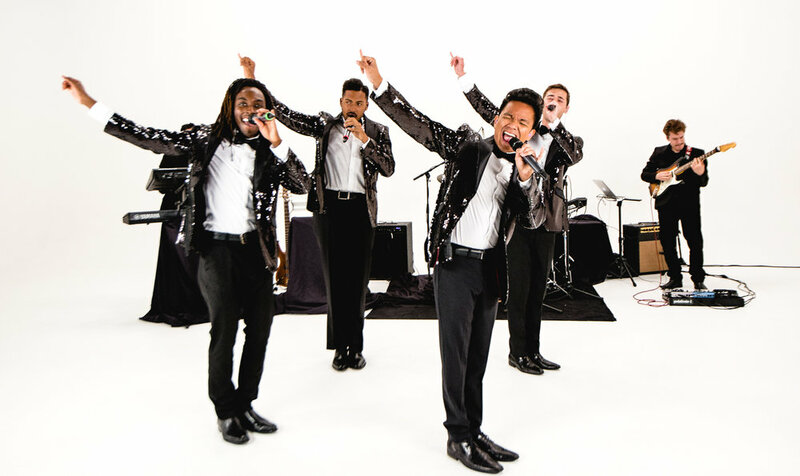 PDA covers anything from the classic boy band era - Jackson 5, The Temptations, The Four Tops - to the 90s superstar era - Boyz II Men, N'Sync, Backstreet Boys - all the way to the essentials of today - Justin Timberlake, Justin Bieber, Bruno Mars. PDA comes complete with turn-key sound production and stage lighting, a full-service, live female DJ with unlimited playlists, and the ability to emcee your event. The band also offers a female singer as an add-on, if desired, for any private event package. Book PDA Band for your big wedding day, your next private happening, or your upcoming corporate event. Amazing party guaranteed. Here's the songlist -- or check it out on spotify!